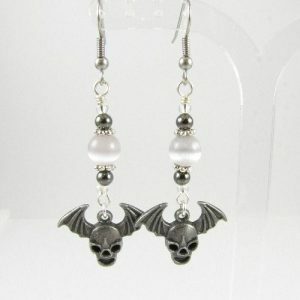 Here you can find my Steampunk & Gothic inspired jewellery. 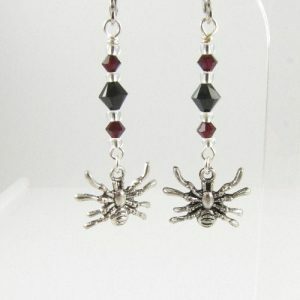 Spider earrings – handcrafted with black and siam Swarovski bicone crystals and Tibetan silver spider charms. They hang on silver plated continental ear wires. Bat earrings with Fossil Jasper beads – handcrafted with Tibetan silver daisy spacers, Fossil Jasper beads and Tibetan silver bat charms. They hang on surgical steel ear wires. Alien skull earrings – handcrafted with grey Cat’s Eye beads, Tibetan silver daisy beads and alien skull charms.They hang on surgical steel ear wires. 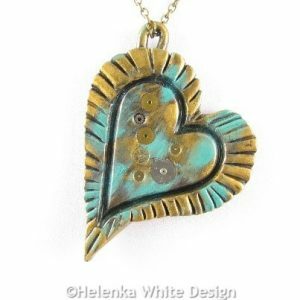 Steampunk heart pendant in antique copper – handcrafted with polymer clay, acrylic paint and Gilder’s paste in antique copper and German silver. 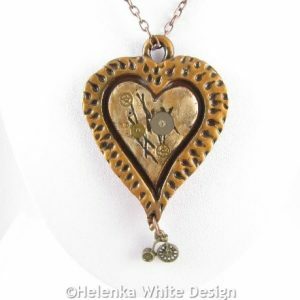 The heart has real watch parts and hangs on an antique copper chain, which closes with an antique lobster clasp. Steampunk heart pendant in celtic bronze – handcrafted with polymer clay, acrylic paint and Gilder’s paste in Celtic bronze and German silver. The heart has real watch parts and hangs on an antique copper chain, which closes with an antique lobster clasp. Steampunk heart pendant in green – handcrafted with polymer clay, acrylic paint and Gilder’s paste in green patina and Celtic bronze. The heart has real watch parts and hangs on a gold bronze chain, which closes with a gold bronze lobster clasp. Pearl and gold bat pendant made with black polymer clay, gold Mica powder and black Japanese seed beads. The pendant hangs on a gold plated chain. Black and gold bat pendant made with black polymer clay, gold Mica powder and red Japanese seed beads. The pendant hangs on a gold plated chain. Large gold bat pendant made with black polymer clay and gold Mica powder. The pendant hangs on a gold bronze chain. Large bat pendant in copper made with silver polymer clay and antique copper Mica powder. The pendant hangs on an antique copper chain.